Challenge Your Family or Schoolmates to a Friendly Duel! 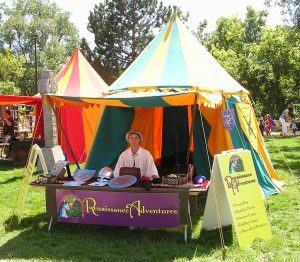 Renaissance Adventures joins some of the best festivals across the Front Range. Visit us at our swasher dueling booth to test your mettle, pick your swasher, and raise foam against combatants in this friendly and family-appropriate event. We come in costume, bring swords aplenty, and make sure that everyone has a safe and exciting time. For larger festivals with grassy turf, we often set up medieval tents to simulate a medieval festival. 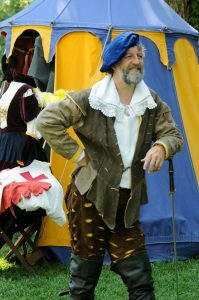 In the past, we have also teamed up with others to host leather crafting, medieval raiment show-and-tell, storytelling, and other activities. Below is a list of festivals in Colorado we usually join. To learn if we are definitely joining any particular festival, please see our Program Calendar. If you would like us to join your festival or event, please contact us by email or phone at (303) 786-9216. Contact us to discuss bringing our festival booth to your event.